The Greenwall Company reveals the biggest design trend of 2019 – greenwalls in the bathroom. 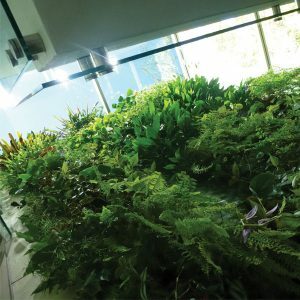 Greenwalls have grown significantly in popularity this year and as a result, are more readily available in a variety of designs for bathrooms. 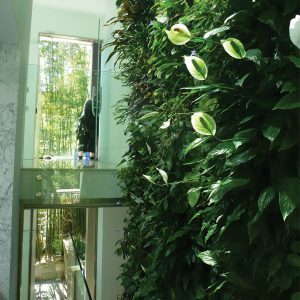 There are a number of benefits to greening your bathroom including improved wellbeing and home air quality, absorption of pollutants and noise, and guaranteed aesthetic impact, now home improvement shows are driving the greenwall trend. Mark Paul, Founder of The Greenwall Company says, “With so many benefits to green living and design, the trend is evolving and becoming more popular. Greenwalls in the bathroom are low maintenance – they eliminate unwanted pollutants and toxic fumes from the bathroom and only need to be maintained a few times a year. “30 years ago I built what is believed to be the very first greenwalls in Australia – now today with green design being an influential part of the public domain, design interest has progressed and I have seen a significant increase in demand over the past 12 months. Adding a greenwall to your bathroom will give amenity and help regulate the temperature, and increase relative humidity and air oxygenation in your home,” says Mark. • Boston Fern [Nephrolepsis] – A popular variety of fern with cascading fronds, the Boston fern has pantropical to subtropical distribution. • Bromeliads – Incredible plants that release oxygen and removes air pollutants during the night. • Aroids – With beautiful foliage, amazing flowers and berries, they perform well indoors and in lower-light conditions. • Gesneriads – African violet family, repeat flowering tremendously beautiful and eye-catching. It’s a perfect design feature for the bathroom. • Peperomias – Peperomias clean the air with sympatric soil flora associations that bind and breakdown chemicals, such as formaldehyde or other indoor toxins associated with building construction and fitout.